Sverdlovsk plane crash: Aeroflot Lisunov Li-2 crashes in a snowstorm. All 19 aboard are killed, including almost the entire national ice hockey team (VVS Moscow) of the Soviet Air Force – 11 players, as well as a team doctor and a masseur. HMSubmarine Truculent collides with Swedish oil tanker Divina in the Thames Estuary and sinks; 64 die. In West Virginia, 372,000 coal miners strike (they remain out until March 3). British Columbia B-36 crash: The U.S. Air Force loses a Convair B-36 bomber that carried a Mark 4 nuclear bomb off the west coast of Canada, and produces the world's first Broken Arrow. In an election speech at Edinburgh, Winston Churchill proposes "a parley at the summit" with Soviet leaders, the first use of the term "summit" for such a meeting. Walt Disney releases his 12th animated film, Cinderella, in Hollywood. March 18 – The Belgian government collapses, after the March 12 referendum favouring of the return from exile of King Leopold III. The pilot series of the world's longest-running radio soap opera, The Archers, is first broadcast on BBC Light Programme. June 16 – Maracana Stadium, which becomes a well-known sports venue of Brazil, opens in Rio de Janeiro, in advance of the opening of the 1950 FIFA World Cup in the country, on June 24. 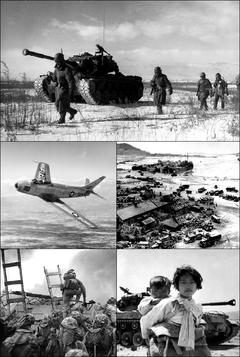 July 14–21 – Korean War - Battle of Taejon: North Korean forces capture the city held by the U.S. 24th Infantry Division, but the delay allows establishment of the Pusan Perimeter. July 30 – 4 workers striking over the "Royal Question" in Belgium are shot dead by the Gendarmerie, at Grâce-Berleur near Liège. August 1 – Crusader Rabbit, the first animated TV series, debuts on television in the United States. 2 Squadron SAAF departs, to take part in the Korean War. In his encyclical Humani generis, Pope Pius XII declares evolution to be a serious hypothesis, that does not contradict essential Catholic teachings. November 17 – Tenzin Gyatso, 15, is formally enthroned as the 14th Dalai Lama, becoming temporal ruler of Tibet. ^ "Athletes - Famous Olympic Athletes, Medalists, Sports Heroes". 9 May 2017.